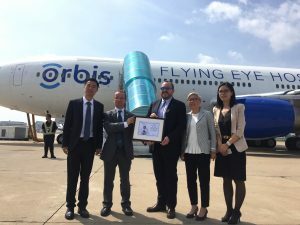 Shanghai, China, September 8, 2016 /ChinaNewswire.com/ - AccorHotels has shown its support for the recent launch of the new Orbis Flying Eye Hospital, the world’s only accredited teaching hospital aboard an MD-10 aircraft, in Shenyang, China. The recent arrival of the third-generation of Flying Eye Hospital in the Liaoning province aims to provide eye care professionals with an intensive three-week regional ophthalmic training in Shenyang. Hosted by He University Eye Hospital (HUEH), a leading eye hospital in Shenyang, the programme will strengthen the hospital’s capacity to deliver subspecialized eye care services, while creating well-functioning training models (i.e. train-the-trainers) for its residents. Orbis will conduct a series of events and symposia with HUEH and international speakers from September 5 to 23, 2016 in Sofitel Shenyang Lido. The hotel is also the venue sponsor for its opening ceremony on September 6 and will be supporting the various activities organised by Orbis and their hospital partners during the three-week event. This support is part of the Stay for Brightness three-year corporate social responsibility (CSR) programme launched by AccorHotels in partnership with Orbis since 2014 with the aims to educate the community on preventive eye diseases and blindness in rural China. This year, AccorHotels continues its support for the Stay for Brightness programme in partnership with Orbis to build a comprehensive pediatric treatment network in Greater China for children in need of affordable quality eye care services and training facilities for ophthalmologist and specialist doctors through donations in cash and in kind. For the remaining quarter of the programme, a number of fund-raising campaigns are already in place to include the “Darkness To Go” blackout charity dinner in Hong Kong that will take place later this month and a larger scale charity bike ride event “For Their Eyes Only” to take place in October this year.